A young boy travels to the hills of Appalachia to meet the old-time fiddle player whose music he has admired, and so sparks a friendship that will forge a bond between generations. The boy develops under the man’s care and instruction, just as seedlings grow with spring rain and summer sun. From playing on the front porch to performing at folk festivals, the two carry on the tradition of passing the music down. 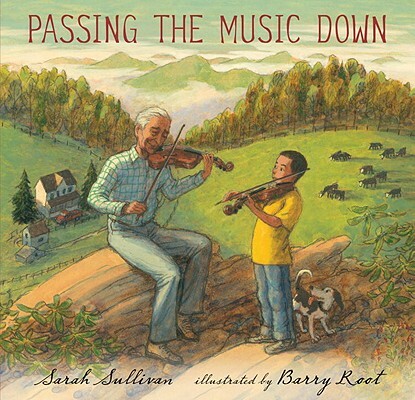 This touching, lyrical story, inspired by the lives of renowned fiddlers Melvin Wine and Jake Krack, includes an author’s note and suggested resources for learning about the musicians and the music they love. Sarah Sullivan, the author of Dear Baby: Letters from Your Big Brother, is a recipient of an MFA in Writing for Children from Vermont College. She lives in West Virginia, where old-time fiddlers play throughout the seasons. Barry Root has illustrated many books, including Paul Fleischman’s The Birthday Tree and Ted Kooser’s Bag in the Wind. He lives in Pennsylvania.